It’s always so interesting to watch people at my workshops. There’s people from all different crafting backgrounds, from beginners to veterans, and of all ages too. Suffolk puffs are so easy to make – well, for me, anyway, as I’ve made them hundreds of times and used them for lots of different projects. 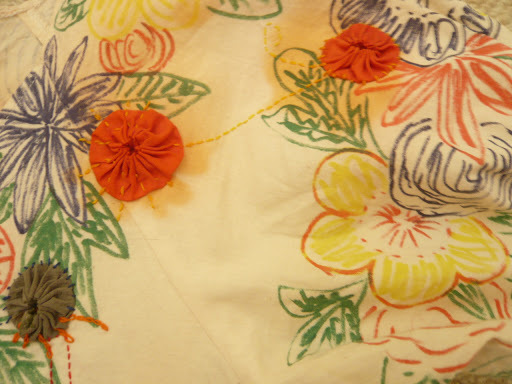 But for beginners who have never held a sewing needle, they can be a real challenge and it can take half an hour just to make one! And even experienced crafters can do with some inspiration. I love seeing their faces when they realise what they can do with these little circles of material. 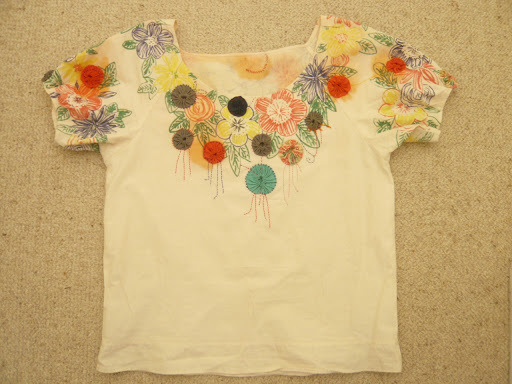 For instance, you can use them to decorate a top like the one I was wearing. I made this top from organic cotton left over from a throw I made for a friend. 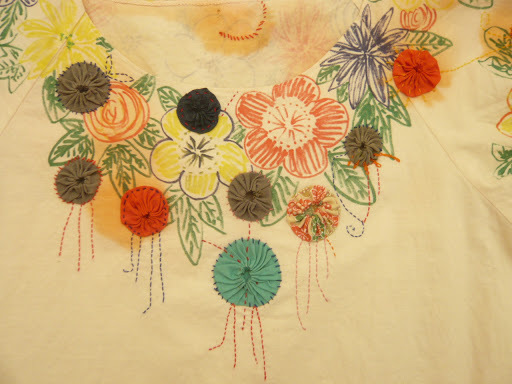 I then drew flowers on it with fabric textas and sewed the puffs on with embroidery thread. Some of the puffs were not colourfast so they have run, but it adds to the character of the top. I always get lots of compliments when I wear it – but it took AGES to make as any crafter might imagine. Each puff takes about 5 minutes to make once it’s cut out, so even just the puffs took about 2 hours, let alone the rest of the process. But I know that no one else has a top like this! By the way, thanks again to Lara, this time for this post! Wow, you hand drew these flowers? That is fantastico! I love it… very much. ^^ great job. Love this, Leeyong. This might get my crafting motor running again.